برای دیدن مثال، اینجا را کلیک کنید. 1. Resistance to oxidation and to scaling. 2. Retention of strength at the working temperature. 3. Structural stability as regards carbide precipitation, spheroidisation, sigma formation and temper embrittlement. Other properties may also be important in particular applications, such as specific resistance and temperature coefficient for electrical purposes, coefficient of expansion for constructional units and resistance to penetration by products of combustion in many furnace applications. In the case of gas turbine steels additional characteristics have to be considered; internal damping capacity and fatigue strength, notch sensitivity and impact strength (hot and cold), machining and welding characteristics, especially as large rotors may have to be built of small sections welded together. The scale which forms on iron is porous and loosely adherent, but it is rendered adherent and protective by the addition of certain elements to the steel. These are usually chromium, silicon and aluminium, and they are characterised by their great affinity for combining with oxygen, but the reaction is rapidly stifled by the formation of the inert oxide films. The resistance of mild steel to oxidation is vastly improved by forming an aluminium-iron alloy on the surface. This is done by heating at 1000°C in contact with powdered aluminium (calorising) or by metal-Spraying the steel surface with aluminium, coating with bitumastic paint to prevent oxidation and heating to 780°C (aluminising). vacuum melting permits the use of advantageous compositions which cannot be melted by conventional methods. lt also improves ductility in the transverse direction. Mechanical properties, are improved by the addition of various elements. Cobalt, tungsten and molybdenum cause the steels to withstand the action of tempering. High alloy austenitic steels have no change points and therefore do not harden by air cooling, but their resistance to wear resistance is not great. A sufficiency of elements such as silicon and chromium raise the Ac, point to temperatures above those reached in service and prevent the steel from air hardening on cooling. Steels with high nickel content should not be used at high temperatures in contact with gases containing sulphur dioxide or other sulphur compounds, since intercrystalline films of nickel sulphide are formed. In high chromium steels the carbides coalesce into large particles which have less obstructive action on grain growth of the ferrite at temperatures above 700°C. The excessive grain growth reduces still further the toughness which these steels possess. Grain growth also occurs in the austenitic steels above 1000°C, but no trouble arises since they remain tough and ductile even in the coarse grained condition. 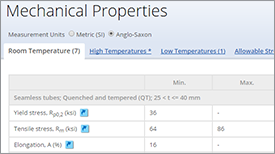 When heated in the range 500-900°C austenitic steels precipitate carbides along the boundaries of the austenite and as a result intercrystalline cracks are liable to develop if the steel is stressed continuously in tension in this temperature range. With certain compositions both ferritic and austenitic steels are embrittled by the formation of sigma phase. 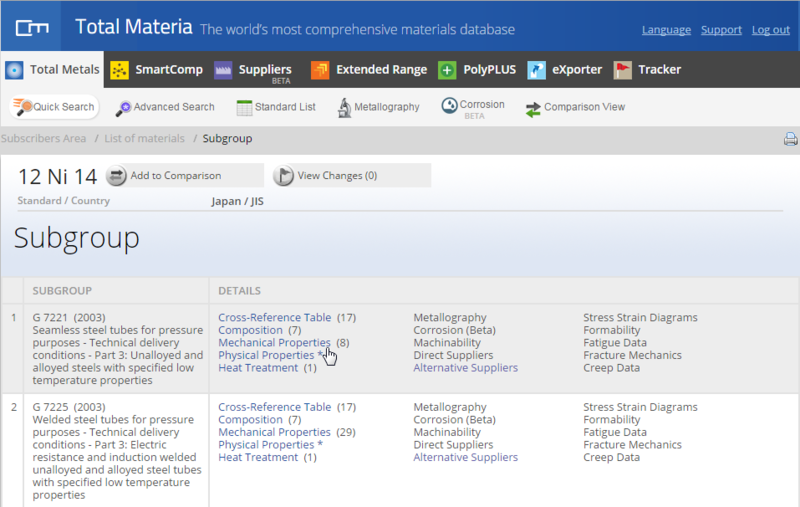 Total Materia has mechanical properties inserted for many thousands of materials and accessing them is just a click of a button away. 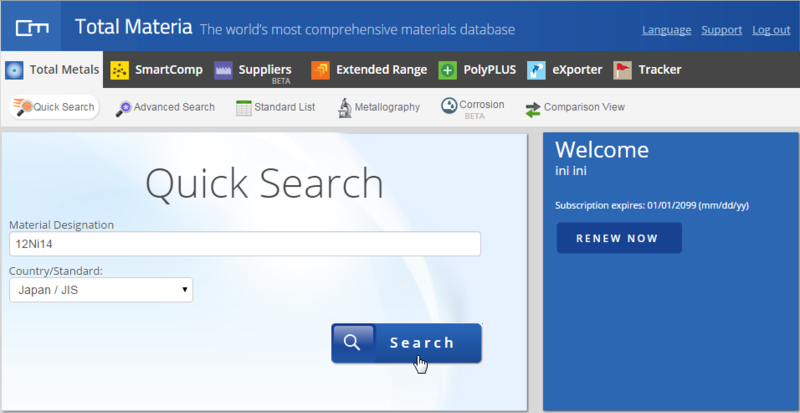 Covering a wide variety of property information, it is easy to find yield stress, tensile stress and elongation data for a huge number of materials within the database. 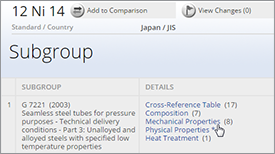 On the subgroup page, click the Mechanical Properties link to view property data for the selected material. 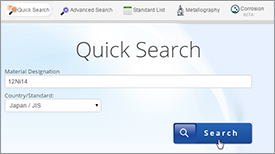 The number of mechanical property data records is displayed in brackets next to the link. 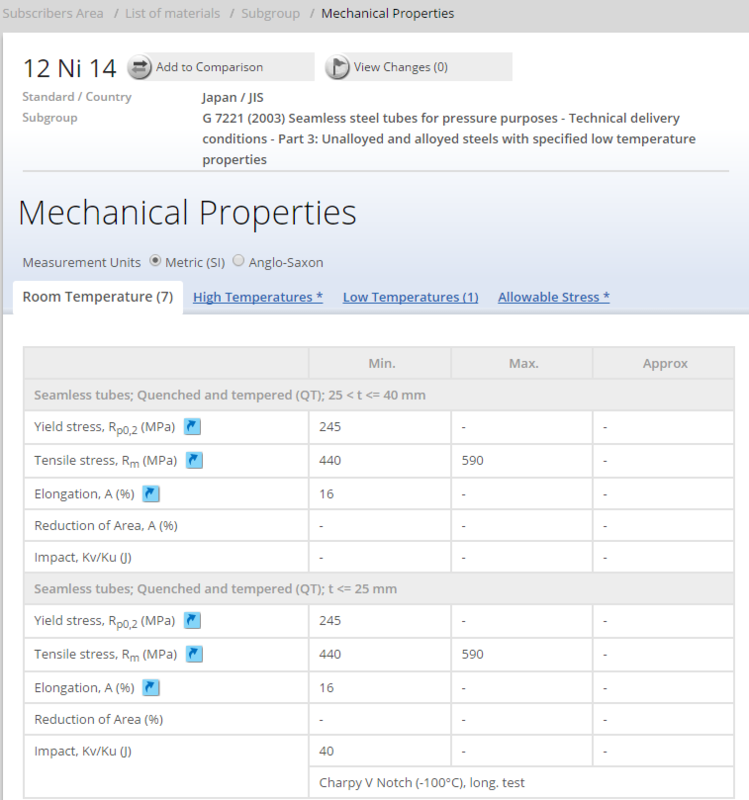 The mechanical properties data will be then be displayed along with all selected material information for your reference. 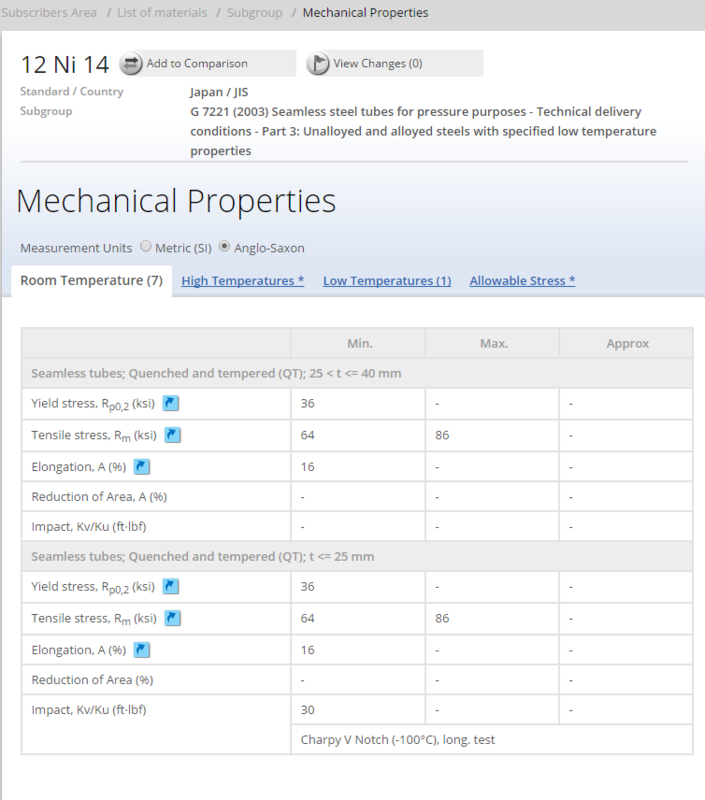 The mechanical properties data will be displayed for all available conditions and treatments. 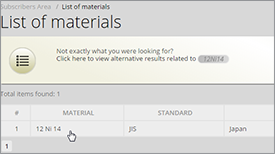 It is also possible to switch between metric (SI) and Anglo-Saxon units with one click depending on your preference.